FRANCE: The country is set to leapfrog the UK and Spain into second place in Europe for installed wind capacity by 2030, according to WindEurope CEO Giles Dickson. Germany would retain its position as Europe’s wind power leader, but due to policies brought in by the new French government and progress on its continent-leading four floating offshore projects, France was likely to climb up the table, Dickson said. 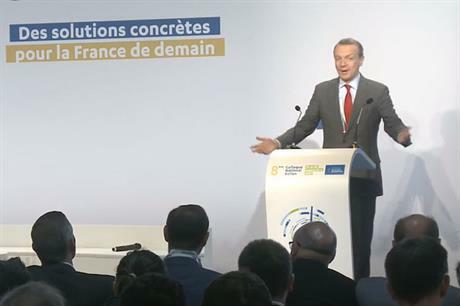 Dickson encouraged the French wind industry to call on president Emmanuel Macron’s government to foster closer ties with Germany in leading the energy transision in Europe. He was speaking at the French Wind Energy Association’s (FEE) annual conference ahead of WindEurope publishing its outlook for 2030. "The general message from where we sit watching everything happening in Europe, the outlook for France is perhaps the most positive that we can see in Europe," Dickson said. As of 1 September, France had over 12.8GW installed capacity, all of which is onshore, according to Windpower Intelligence, the research and data vision of Windpower Monthly. New environment minister, Nicolas Hulot, shelved plans for a French offshore zone in August, but with French companies, including Ideol and Dietswell developing floating projects, France could soon open its offshore account, however, Dickson added. The country trails Germany (52.8GW total installed capacity), Spain (23.1GW) and the UK (16.2GW). But uncertainty in Spain and the UK meant France was well-positioned to overtake the two countries with more installed wind capacity, Dickson said. Meanwhile, in Germany, the latest auction rounds have also created obstacles for the industry. "Of course the German market will remain," he added. "It is the only government which has already established regulations for onshore and offshore wind that have gone to parliament. "But as we know they had problems with the auctions. They wanted to target community projects, but they don’t know exactly when these projects will be installed."